Spurs remained within arm’s reach of Manchester City and Liverpool with a 3-1 win over Leicester and, while they might not have seized all three points in the fashion in which their title-rivals City did, the three points keeps them very much in contention for top spot come the end of the season. The absence of both Harry Kane and Dele Alli has hardly knocked the north London outfit back to the extent many surely thought it would, as Fernando Llorente and Heung-min Son continue to deputise capably up front – the latter was on hand to net his side’s third of the day and his third in the last three games. In Davinson Sanchez, Toby Alderweireld and Jan Vertonghen, Spurs have a defensive contingent to win titles but they have often been lacklustre at full-back – Danny Rose is getting back to his best but both Serge Aurier and Kieran Trippier can be suspect when called into defensive action. 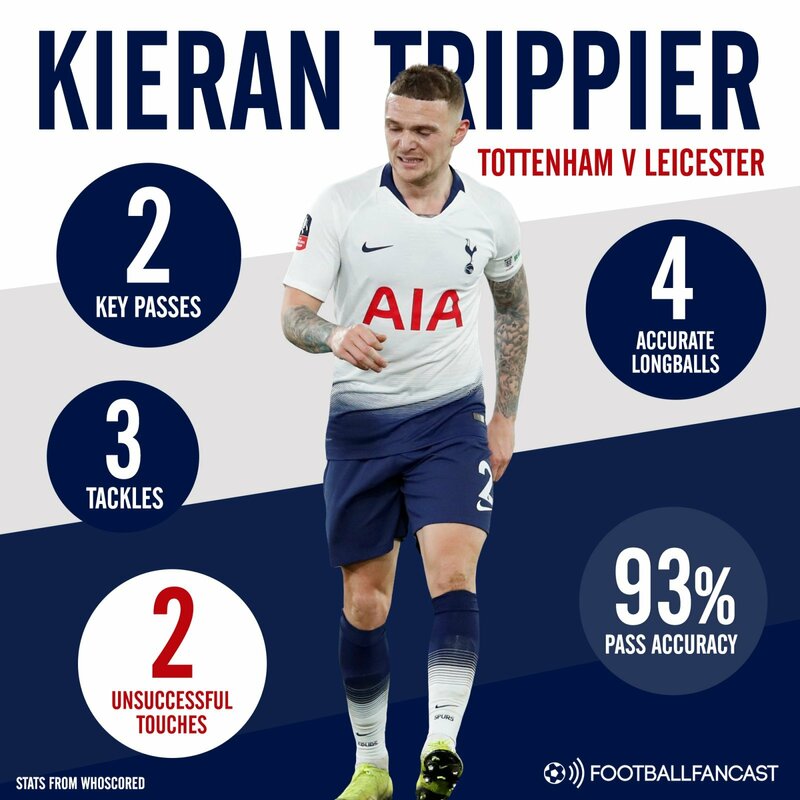 The latter is a threat on the front foot and, as we saw in the World Cup, has a magic right foot but his lack of positional awareness combined with a lack of speed mean Spurs are often exposed on the counter and Sunday’s clash with the Foxes was no exception, despite what the stats tell you. Unlike the 28-year-old, Leicester have bags of pace and looked to hit their hosts on the counter wherever possible through Demarai Gray and the Jamie Vardy, who was introduced on the hour. Playing right-back in a 4-1-2-1-2, Trippier was surely tasked with providing width and hitting target man Llorente – he obliged, completing four out of five of his attempted long balls while also attempting seven crosses. Also completing two key passes, the England man was influential going forward as his side looked to cut open the visitors but he has gone 11 games without an assist. The former Burnley man is mostly dependable in possession and, while he did take two unsuccessful touches, completed an impressive 93 per cent of his attempted passes – by far his highest rate of the Premier League season so far. As previously mentioned, the Spurs number 2 can be caught napping on the back foot but completed a joint-team-high three tackles as he got stuck into the tie and battled for the ball. The stats make for pretty impressive reading, but what they don’t tell you is that he was frequently caught out of position as his keenness to get forward could have cost his side on a different day against a better opponent. Take City for instance; last time the two sides met, the defender was caught out earlier on as the Etihad Stadium outfit found a lead within six minutes as Raheem Sterling burst beyond his national teammate with ease before squaring to Riyad Mahrez. Spurs might get away with playing in such a manner against the lesser teams in the league – Claude Puel’s side might have won the title in 15/16 but they have lost five of their last six games in all competitions – but they will undoubtedly be exposed when they compete with their direct rivals. Trippier is far less of a risk when playing in a five-back formation and, if Mauricio Pochettino is going to start him against the big boys, he might want to switch to such an approach – he does have the personnel to do so. The only other option is to drop him, which would be a shame considering the attacking threat he provides.